1. Tank vs. track: When you absolutely, positively have to destroy a race track surface so it can be repaved and ready for a fall NASCAR Sprint Cup race, call in the National Guard. 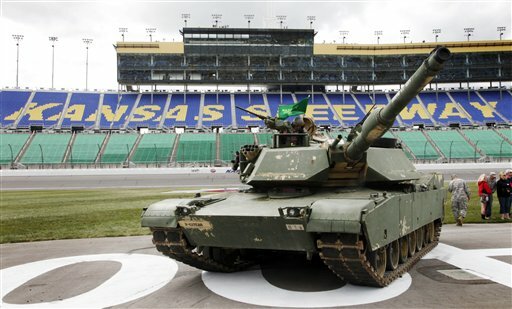 That’s what they did in Kansas on Sunday, using military equipment and know-how to break up the asphalt. As deployments go, you could do worse than the infield of a Sprint Cup race. 2. Falcon left behind: Missing from this video of President Obama honoring the Air Force Falcons football team at the White House on Monday is senior running back Asher Clark, who is not “meeting academy standards” and was not allowed to make the trip, according to this report. Clark stared 40 games over four seasons for the Falcons and is second on the all-time rushing list. 3. Better news from the sidelines: Another one from Frank Schwab at the Colorado Springs Gazette — read this feel-good story about former Air Force defensive coordinator Richard Bell returning to the sidelines at age 74 to help out a high school squad. 4. Speaking of former coaches: Despite years of therapy, Air Force football fans might still remember a 31-30 loss to nationally ranked Tennessee that started the 2006 season with a whimper. Why did head coach and College Football Hall of Famer Fisher DeBerry go for a late two-point conversion instead of playing it safe? He tells all here, and it sounds like he’d do it again. 5. Book your tickets: If Navy wins six games this year, it’s booked to play in the Kraft Fight Hunger Bowl, which will be held Saturday, Dec. 29 at AT&T Park — formerly Pacific Bell Park, formerly SBC Park … it’s safest just to go with “The Field Where the San Francisco Giants Play Baseball.” The game will be broadcast somewhere on the ESPN family of networks and is scheduled to include a team from the Pacific-12 Conference as well as the Mids. 6. Baseball milestone: The Army Black Knights, thanks in part to a Saturday no-hitter by senior southpaw Logan Lee, rank 30th in the nation in the National Collegiate Baseball Writers Association poll — a first for the program. Army (33-9) is a perfect 16-0 in the Patriot League and will face Marist on Wednesday.